We are getting used to see drawings, patterns and graffiti in several corners of our cities whether we are home or abroad. Street art is changing the face of our cities all over the world, in Sicily more than anywhere else, lately at least. Both the Eastern coast and the Northwestern region of Sicily, where we picked most of our villas, are becoming the crucial crossroads of street art in Southern Sicily; mostly thanks to the artists who drew their murals on the walls of Palermo, Catania, in the Agrigento area, and lately in Ragusa. 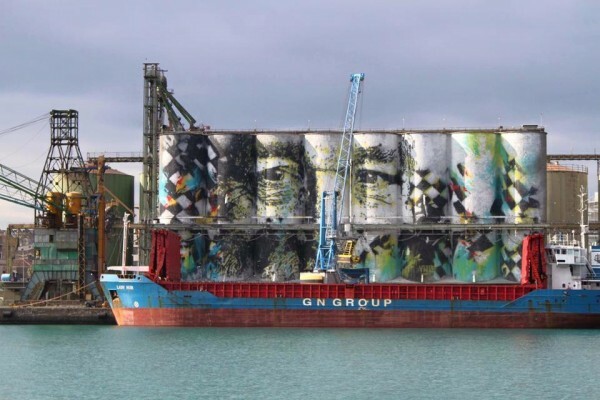 The island has recently achieved an unusual record: hosting what is believed to be the largest street art piece in the world, on the silos of Catania’s port. The mural is tall as a ten-storey building and wide as a football field, and it was created by an artist known as Vhils. Last December Enzo Bianco, the city mayor, hosted a public ceremony to inaugurate the work of the Portuguese Alexandre Fardo aka Vhils, who wanted to celebrate Sicily as a meeting point and a melting pot of different cultures. The piece has been realized thanks to Fondazione Terzo Pilastro – Italia e Mediterraneo. Vhils’ work gives a deep sense of empathy and solidarity: a man is looking straight at East across the sea; hi eyes are pointed on Egypt, Turkey, Syria, Jordan and Lebanon, and somehow they are the mirror of the hopes and dreams of people living on the other side of the Mediterranean. In art lately many are debating whether street art belongs or not inside museums. Vhils’ mural in the port of Catania shows how this particular kind of art is a living part of a city, of a place, and how it would lose its deepest meaning if we eradicate it from the spot the artist chose. Moreover the street artists who visited Sicily’s most important towns in the last few years created a real museum in plen air, most of the times literally changing the face of those who were formerly considered “though neighbourhoods”.